All development activities have an impact on the environment, from large-scale open pit mining, to drilling for oil and gas, to clearing land for building a house. In the case of your house, you might want it to stay around for a long time. But in the case of oil and gas wellsites, we’d rather see the land recovered to its original state once the oil or gas resources have been extracted. The company leasing an oil or gas wellsite completes a variety of remedial actions that are designed to return the land to a condition similar to that prior to drilling. These remedial activities are based on reclamation criteria issued by the Government of Alberta. Once reclaimed, the company receives a certificate from the government and the site is considered reclaimed. By the end of 2012, almost 400,000 wellsites had been drilled in Alberta. Of those, over 100,000 have been certified as reclaimed. Until the Ecological Recovery Monitoring (ERM) project, there hasn’t been a comprehensive program to revisit reclaimed wellsites to assess their ecological recovery. 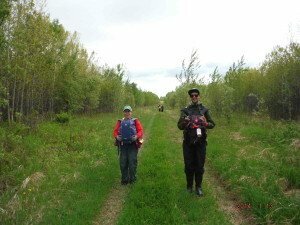 Technicians sampling in the boreal forest, summer 2014. 2014 found the ERM project team sampling in the boreal forest near Slave Lake and Fox Creek. The team assesses ecological recovery by measuring soil and vegetation on the wellsite, and at nearby reference areas where the land hasn’t been disturbed by industrial activities. The two sets of samples are then compared to see how the wellsite is recovering. Our results to date show that, for decades post-certification, reclaimed wellsites in forests and native grasslands have not yet fully recovered. In the Dry Mixedgrass Natural Subregion, these former wellsites have lower total plant cover, species richness, and species diversity than do the reference areas. For both forests and native grasslands, non-native plant species cover is also higher on reclaimed wellsites compared to reference areas, regardless of how long ago the wellsite was reclaimed. Ecological recovery is a complex and slow process. Recognizing this, the ERM project is designing a long-term monitoring program for certified reclaimed wellsites in Alberta. Learn more about the ERM project – and see our team in action! – in this video of field work near Slave Lake, Alberta! The ERM project was initiated in 2012 by Alberta Environment and Sustainable Resource Development’s Land Monitoring Team. The project is led by the ABMI in collaboration with Alberta Innovates – Technology Futures. In 2014, the Government of Alberta established a new environmental monitoring agency, the Alberta Environmental Monitoring, Evaluation, and Reporting Agency (AEMERA), with a mandate to monitor and report on the condition of and long-term trends in land, air, water and biodiversity in the province. The information obtained by the ERM project is expected to support the development of a province-wide monitoring program, potentially administered by AEMERA. Additional funding was provided by the Alberta Upstream Petroleum Research Fund.